Comedy triple-threat Roman Danylo makes his return appearance to What's So Funny? tonight. Only this time, he's on his own. The star of TV's Comedy Inc. does it all – improv, sketch, and stand-up. Now add to the list: stripping. Well, sort of. Danylo's latest brainstorm is a six-person shirtless combo called Comedy Strippers, which runs monthly at the Improv Centre on Granville Island. It's as silly – and funny – as it sounds. Six guys named Chip prancing around the stage wearing tight black pants and a bow tie putting on a comedy show. Wrap your head around that! He'll explain it all tonight. So tune in to CFRO 102.7 FM at 11 pm in Vancouver or livestream it at coopradio.org. I just sailed back from the Blue Bridge Comedy Festival in beautiful downtown Esquimalt and jolly old Victoria (more on that later) and realize I don't have a guest booked for tonight's show. 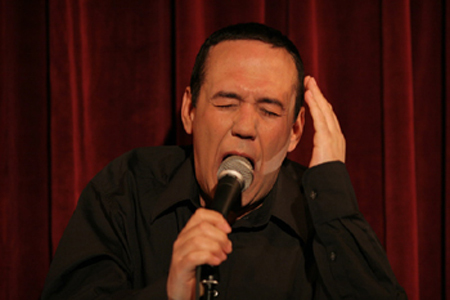 Next week we've got Chip Danylo of the Comedy Strippers, but tonight we'll run a repeat... er, special encore presentation of that Gilbert Gottfried episode, which was lots of fun. Maybe you caught Gilbert on the most recent Comedy Central Roast of Roseanne, so there's that tie-in. I'm stretching here, but go with me. I know, you can listen to it whenever you want on iTunes, but not all of my radio listeners are so tech savvy and maybe they haven't heard it before. So that's the plan, Stan. Join us at 11 pm PDT for the rewind show. On this last day of the Olympics, we have a What's So Funny? record-setter in studio. Graham Clark will be making his record 11th appearance on the show tonight. Let's crunch the numbers. He's been here four times as a solo guest, three times with one other guest, twice as a guest host, and once with a comedy roundtable. Tonight he'll be solo once again. Graham and his beard (and I don't mean his fake girlfriend) just got back from London, England, so maybe we will have some Olympics talk. But we'll also talk about his show there, as well as his globetrotting with podcast partner Dave Shumka as they take their Stop Podcasting Yourself juggernaut on the road to various outposts. And lots more, I'm sure. Tune in tonight at 11 pm PST at 102.7 FM or livestream it from anywhere in the world at coopradio.org. After all, the sun doesn't set on the Graham Empire. This Week in Press Releases brings you news from Montreal, where three lucky (and talented) artists struck comedy gold. Congratulations to Mark Little, Dan Beirne and Andrew Bush. August 10, 2012, Montreal, QC. – The Amazing Tales of Mr. Evans created by Mark Little and Dan Beirne has been selected by Cracked.com as the project designated to receive a development deal. The winner will also receive the opportunity to become a YouTube Partner. Custodial created by Andrew Bush has been selected as the winner which will be invited to participate as an “Official Artist” at the New York Television Festival from October 22–27, 2012. Both winners were selected after web and TV pitch competitions, presented by the Fonds de solidarité FTQ, at the recent Just For Laughs Comedy Conference. The Conference is a 3-day event held during the Just For Laughs Festival, presented by Videotron in association with Loto-Québec, in Montreal, Canada. The festival is now the world's largest and most prestigious comedy event welcoming close to 2 million people each summer. Cracked.com Head of Video Michael Swaim led a panel of three judges during the web series pitch session, where five shows were presented before a packed crowd of comedy pros. The judges also included Spencer Griffin, Executive Producer and Vice President of Production at CollegeHumor and JC Cangilla, Director of Business Development at Yahoo! Dan Pasternack, Vice President of Development and Production at IFC, Sarah Fowlie, Director of Independent Production for Comedy at Bell Media, David Bernad, Producer of Enlightened, and Monika Zielinska, Director of Development at Comedy Central presided over the TV pitch session – From Set to Screen: The Sitcom Search. Five shows competed for the coveted prize of being selected as an Official Artist at the next New York Television Festival. Founded in 1983, the Just For Laughs Group has four business units: Festivals, in Montreal, Toronto, Chicago and Sydney; television production, Gags seen in 135 countries and on 95 airlines and Stand-up Specials; live shows, such as Canadian tour dates for Jerry Seinfeld, Jeremy Hotz, John Pinette, Louis C.K., the Capital One Just For Laughs Comedy Tour and Noth American dates for Family Guy Live! ; and talent management. The Just For Laughs Montreal Comedy Festival is the world’s largest and most prestigious comedy event welcoming 1,25 million people each summer. The Festival will be celebrating its 30th Anniversarry in 2012. The Group has offices in Montreal, Paris, Los Angeles, Toronto, London and a small apartment on the Internet. After two weeks away, it's time to get back in the saddle. The saddle being the creaky chair at co-op radio. I'll be there tonight from 11 to midnight but sans guest. It's a holiday weekend afterall. Besides, I've recently come into some more comedy CDs so it'll give me a chance to play them. That's right, an hour of comedy. Go figure. And I'll announce some big station news, too. We're changing frequency in September. Bigger and better. So tune in tonight at 102.7 FM in Vancouver at 11. With the run-away success of the Norm Macdonald video (1103 views and counting), I decided to add another video snippet to the What's So Funny? channel collection. Last night I found two minutes from the Nikki Glaser episode that was snippet-worthy and it's up on YouTube now (6 views and counting). It's our brief debate on the wonders of alcohol.